With another wonderful Christmas behind us and a New Year just around the corner, we have been counting our blessings and decided it was high time to spread some good cheer. 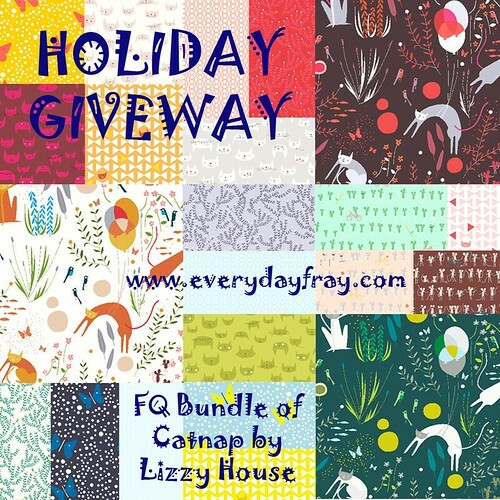 Want to win a 22 Fat Quarter Bundle of Lizzy House's newest line, Catnap? This is your chance! This collection is still only available for pre-order but we'll get it shipped off to our lucky winner as soon as it is released. Leave a comment telling us what you were most grateful for in 2013. For a second entry, leave a comment telling us how you follow our blog. For a third entry, share this giveaway on Instagram using #everydayfraygiveaway. The contest will stay open for 1 week (closing at 8 pm MST on Sunday Jan. 5, 2014). The winner will be posted on our blog on Monday Jan. 6th, 2014.
International entries are welcome, we will do our best to ship anywhere in the world. Earlier this month we celebrated our 200th blog post here at Everyday Fray. Your comments and camaraderie have really made this blog a special place for us. Thanks for joining us in our wee corner of the interwebs. This year I am most grateful for my family and that they are all healthy and safe. I am the most thankful for my new cousin and nephew from Ethopia! I follow your blog through Instagram! I follow you on instagram and have your blog on my favorites list on my ipad. I found you on Instagram! Yay!! I am very grateful for a healthy family. They are my world! Thank you for the wonderful giveaway!! I am the most grateful fir the family within my four walls....hubby, teenage sons, and my toddler daughter. That are the best, and I am blessed!! I follow you on IG, too. Thanks for the chance to win!! I'm a #crazycatlady, so I've been eagerly awaiting this line! I'm most grateful for adding twin baby girls to our family in 2013... Lots of work but loads of fun! I follow your blog on IG and by email. I follow you on IG and through RSS! I'm grateful that I published my first quilt pattern this year. I am grateful for my sweet two year old daughter. I follow by email and instagram. I am most thankful for a healthy family. We've had some ups and downs in 2013, but as long as we have our health, everything will be just fine. I am grateful for so many things that happened in 2013 but I have to say that the one thing I am most grateful for is finding a church that's right for me. I was away from church for 5+ years and kept praying that The Lord would lead me to the right church. I have a great church family and I'm thankful that God is in my life again. God is so good. I am absolutely the most grateful for my wonderful family this year. Thanks for the give away! So grateful for my family especially my sweet new baby girl who arrived on January. Can't believe she's nearly one already! I am most grateful for the health of my family! Thank you and Happy New Year! Most grateful for my renewed health, which allowed me to complete an open water 1 mile, 1.5k! I am most thankful for my boyfriend working so hard at his job so that I can stay home with our son. I am most grateful for my family and my health. Congratulations on 200 blog posts! It is a wonderful giveaway. I am thankful for the people in my life, family and friends. And I follow you via Feedly. Oh wow! Good one guys. :) I'm thankful for my new sewing room! I am grateful for my family. My parents have had a tough year health wise and are now doing fine. Very Very thankful for them. I follow your blog thru quilting blogs. My sweet Mother passed away on Jan 6. As I look back on the year I am most grateful for her loving, selfless, nonjudgmental, creative, earth loving influence on my life. I follow on IG & visit blog & just found you on Pinterest! I am most thankful for my wonderful husband, who supports my fabric addiction and my 2 wonderful children, who have grown to be the most thoughtful adults. I follow on Google Friends! I'm most grateful for my family's good health. Last year, my youngest was hospitalized in the ICU two times, but this year, he has been very healthy and I thank God for that. Thank you for the chance to win! I follow via Bloglovin', thanks! My boys! Always eternally grateful for my 2 little guys! And a forever follower on BL and IG! I am most grateful for the good health and happiness that our family had through 2013. Grateful for the chance in this great giveaway too! I am mostgrateful that y husband and I were in a position to let our (now) 14 year old son follow his dream and play hockey at a higher level. It has meant splitting our family between Colorado and Washington, but has been so incredibly rewarding for him and has brought us all so much closer together as we really appreciate the blessing of having each other. I am thankful for my new grandson who is as perfect as can be.. Thanks for the great give-a-way!!! The year started out on a sad note for us, losing our beloved 14 yr old dog. So I'm most grateful that in July, we adopted a puppy from the shelter and he has turned out to be a sweet and loving addition to our family. I'm most grateful for my dad surviving a heart attack and open heart surgery. I am also grateful I have two sweet and healthy little girls! Thanks for the giveaway! I follow you on Bloglovin' & Instagram! I am grateful for the many scary changes this year, as thy have allowed me to grow and change at such a rapid speed, and level up in so many ways. I am grateful also to my partner, who has stood by me through these 4.5 years of chaos! I am most thankful for the people I love who had brushes with that ugly word that starts with C, come through their surgeries and treatments with little or no side effects. After a knee injury in August, I am most grateful for knee surgery that has allowed me to walk without a cane again! I am grateful for a happy, healthy family. They make me smile every day. I follow on Ig. Thank you for this giveaway. I follow you on Instagram and via email. I'm grateful that my family got safely moved halfway across the country. Wow - what a wonderful, generous giveaway! I can't wait to get my hands on this gorgeous line! The thing I am most grateful for in 2013 is the perfect healthy baby that I'm carrying, and who we are so excited to meet in January! I'm grateful that Christmas is over! Is that awful? Getting back to normal meals and a normal routine feels so good. I am so grateful for healthy grandkids! I'm thankful for my new baby and her big sister! I follow you on Bloglovin. LOVE your blog!! I have so much to be thankful for this year. My elderly father has needed me so much this year and that has been stressful, but also great. I have been driving 2.5 hours each way every week to see him and take care of him. It has been such a great time to spend with him. I have 4 cats and would love to win a bundle of this amazing fabric! Thanks, ladies!! I'm grateful for a healthy, wonderful family! I most grateful for finding love this year. Thank you for this wonderful giveaway! I'm incredibly greatful for my friends, those in the flesh and the ones I've met on IG. I am most grateful for perspective in 2013. It was a rough year, but the experiences really made me realize it 'a all about perspective. I am hoping this gift makes 2014 and beyond the best yet. I saw your giveaway on IG and came to check out your blog. I'm very grateful for two little grandsons I've watched grow this last year. And for all the loves in my life! I'm very thankful for my family in 2013. This was a very tough year on us, but my children rose to the occasion and pitched in and we all banded together and we've made it this far. You see, my husband lost his job in February and I have a chronic nerve disorder and suffer from severe depression. Our daughter was ill in January also and the doctors couldn't figure out what the problem was. We lost our insurance but that is not what I am here to talk about. I'm here to talk about the reaction my family had to this combination of things happening all at once. Both of my children got jobs (my son turned 16 in March and started filling out applications and my daughter got a second job along with a full course load at university). They pitched in to help make ends need when times got/get tough. They haven't complained when we don't go to the movies or eat dinner out. They were the ones that suggested that we not buy a. Tree this year for Christmas. My husband has gone on so many interviews I have lost count. I'm keeping my fingers crossed as this week he has two seconds and a third interview. It would be a blessing to go into2014 with him having a job. My family is an amazing thing and I am so proud of them and love them so much for not complaining and for comforting one another through all of this. If nothing else, in 2013 I was blessed. This year, I am grateful for the birth of my beautiful baby girl. I'd love to make a quilt for her with this fabric. I enjoy your blog ladies. I follow you on my Blogger Dashboard. Thank you for the opportunity to win this lovely new Lizzy House collection. I love cats. In 2013 I'm most grateful for my wonderful husband. He is my light and does so much for our family. I'm a new follower via blog lovin' I love this fabric!! What I am most grateful for this year is Dave Ramsey and the opportunity he has brought for my family and I to become stable financially! Thankful for my healthy kids. Nothing like a scare to realize how thankful you should be for good health! I'm thankful for really great friends and new quilting/knitting homies! Thanks for the chance. This is an awesome prize! In 2013 I am most thankful that my non-verbal 10 year-old son has finally started to communicate his needs and wants in a drect and purposeful way. He's still non-verbal, but he is communicating! Love this new fabric! I follow you on Bloglovin'! Thanks for the chance at your giveaway. What cute fabric! This year I've been most thankful for my (now) fiance. He's been such a phenomenal support through some very trying times. I follow you lovely ladies by RSS through Feedly. Most grateful for health in 2013...2012 ended with a scare. And always for family! I am grateful to have a steady, well-paying, part-time job that allows me to be with my daughter after school. I follow you through email. Thanks for the chance to win this cute new line! Im most grateful for the love and support of some incredible friends through what was a really rough year.and of course fabric therapy! And I follow you via bloglovin! What an awesome giveaway. I am most grateful for the great friends I have met in 2013. I have met some really supportive and amazing people this past year just when I needed it most. 2013 has been a fantastic year, and I am grateful for many things. The heath and well-being of my family, the fantastic ladies I sing with every week....and a grandbaby on the way! I follow you via Feedly, and instagram. I'm very grateful for the love & support of my family this year. While it sounds trite, I couldn't have made it through this trying year without them. One of the things I am grateful for this year is the fellowship and inspiration I have found joining a small modern quilt group. Of course, this isn't what I am most grateful for, which would be family related. I'm grateful for the love and support of my three kids. They keep me functioning, and my three grandchildren keep me laughing! Awesome giveaway - thank you. This year I am so grateful for our great family doctor, it's been a very tough year on our health and we have been well looked after. I am most grateful for my wonderful husband and the life we share! I never take it for granted. I just discovered your blog & instagram so I started following! I was most thankful for my Mother responding well to her treatment regime after being diagnosed with stage 4 Ovarian cancer - really, everything else pales in comparison. Thanks for the chance to win these lovely fabrics. I follow your blog via email subscription. Thanks again and Happy New Year! I am grateful for all the quilty friends I've made this year - both those I see in real life and those I'm yet to meet in person. Having friends who share the same passion has really added to my life. I follow via bloglovin (and of course I follow you guys on IG). Thank you so much for this amazing giveaway - it's very generous! I am grateful for my amazing family, they have been so supportive of me and I love them, I am very blessed. I have shared on IG. To New Zealand - made my year! Hooray! Just read comments and warm heart to see appreciation for friends and family in 2013. Me too! I'm very grateful for my daughter, and family of course, but also for the ability to be creative and sew every day! I follow your blog now through Bloglovin'. I've just shared your pic through Instagram ('becsibbi' on IG account). Thanks for the chance to win! I am thankful for my family. I've had so many up and downs this year and they have been right there to support me. I am grateful for good health in my family and any opportunity I have to be able to sew and create! Thank you so much for an opportunity at such a great give away! I follow you on your blog and on Instagram! Fingers crossed!!!! I am a new follower on feebly. Can't wait to see the back of the mermaid quilt. I am grateful for the many beautiful friends I have made blogging & got to meet in person in 2013. Look at 2014, it will be even better! I am grateful for the talented women in my weekly sewing group. I'm grateful for my husband's continuing good health and the company of my beautiful children! This year I am thankful for my family of four. The fourth was added in July my baby son! I am most grateful for my family and friends in 2013. I follow your blog through Feedly. Thanks for the chance to win! This is going to sound awful but I am most thankful it is finally the end of 2013. It's been a spectacularly bad year and I'm looking forward to good things in 2014. For 2013...Most grateful for my marriage to a fabulously dedicated & generous man! I am most thankful to be close to my family again. After 6 years are being an army wife and moving all over the world, me and my little family are back in Virginia where we belong! I follow your blog via bloglovin!! I posted your giveaway on Instagram and like it as well! I am grateful for getting to go to the Fat Quarterly Retreat this past summer, and för the love and support I receive from my family. I've been following along in Instagram, (@agalinsweden) but now I am following by email too! Love these silly cats! Most thankful that my husband and I had a fun adventure filled year full of laughter and good health. I am most thankful for my husband and 2 kids and that we are all happy and healthy. FOLLOW ON BLOG LOVIN' ! HELLO, SO GRATEFUL FOR THE HEALTH+HAPPINESS OF MY FAMILY MEMBERS! THANKS FOR A GREAT GIVEAWAY! I follow on email at kdavis1@centurytel.net. I am most grateful that everyone in my family is healthy. Thanks for the give away!